Join Daniel Siegel, M.D., in this new, mastery-level certificate course. This transformational course will show you how to apply the Mindsight Approach, which uses the scientifically-grounded principles of Interpersonal Neurobiology, to help your clients overcome even the most challenging clinical issues — including ones that may emerge from insecure attachment and traumatic experiences and manifest as anxiety, depression, relationship difficulties, PTSD and more. In this exclusive new certificate course, Dr. Siegel will guide you step-by-step through six sections of specialized training to master revolutionary strategies and practical techniques that will enhance any therapeutic orientation and provide breakthrough results. Through engaging, easily comprehensible lectures and experiential exercises, you will be able to effectively integrate the IPNB model in your clinical practice. Plus you will also earn a Certificate of Advanced Learning from the Mindsight Institute. Dan’s groundbreaking approach is designed to improve your therapeutic outcomes — no matter what therapeutic model you use. Earn your certificate today! Today Only $1,499.00 — An Unbelievable Value! Get started today for just $499! Earn up to 36 CE Hours and a Certificate of Advanced Learning from Dr. Daniel J. Siegel and the Mindsight Institute! For over 30 years, Dr. Siegel, has been revolutionizing the field of psychotherapy. His scientific research, together with his theories and clear synthesis of the research of others, have enhanced our understanding of the mind, and his innovative techniques have resulted in groundbreaking therapeutic outcomes. Now, for the first time ever, you can gain a mastery-level comprehension of Interpersonal Neurobiology, a powerful framework which combines cutting-edge insights from the wide range of sciences — including neurobiology, math, psychology, physics, sociology & more — so you can offer your clients long-term transformation. 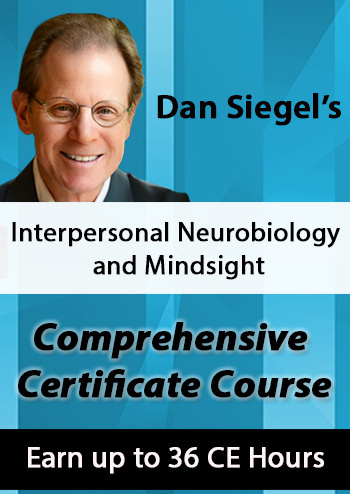 Dan Siegel’s Interpersonal Neurobiology and Mindsight Comprehensive Certificate Course will add additional insight to your current clinical approach, leading to better treatment outcomes in a shorter period of time. Listen as Dr.Siegel offers an overview of the course, including insight into what the mind is from an interpersonal neurobiology perspective and the role that mindsight — insight, empathy, and integration — plays in well-being and rewarding relationships. Join Dr. Siegel to explore the most recent science of what the mind is and how to optimize mental health. Through two engaging modules, you'll master the foundational concepts of integration, energy flow, consciousness, and subjective experience to provide effective therapeutic interventions for your clients. Dive into the fascinating field of neuroplasticity as Dr. Siegel highlights the structure and function of the embodied brain and the bodily systems that shape our mental lives. Take away tools to help your clients integrate body and mind to live with well-being and a happiness that includes meaning, connection, and emotional balance. "Where attention goes, neural firing flows, and neural connection grows"
Explore all stages of development, from conception to adulthood, illuminating how our early life experiences and relationships shape who we are and who we become. Learn the science of relationships, from romance to families and friendships, and discover how to support healthy interpersonal connection. Discover how early attachment experiences relate to patterns in adult relationships and clinical implications for life-long connections that impact our healthspan – how long we live with well-being. With a focus on the Adult Attachment Interview, explore how to help your clients work through traumatic relationships, construct coherent narratives, and create secure attachment patterns throughout the lifespan. Enjoy the most thorough teachings on the key elements of integration, that is, the differentiation and linkage of parts of a system. With detailed explanations, case examples, and clinical summaries of each topic, you will be able to incorporate these elements into your practice immediately. Register now and access an exclusive, live Q&A recording call where Dr. Siegel answers specific Interpersonal Neurobiology questions so you can gain additional insight. And to help you fully grasp the IPNB framework, you will also have access to a one-of-a-kind manual created by the Mindsight Institute specifically for this course. Dr. Siegel’s psychotherapy practice spans thirty years, and he has published extensively for the professional audience. He serves as the Founding Editor for the Norton Professional Series on Interpersonal Neurobiology which includes over 50 textbooks. Dr. Siegel’s books include Mindsight, Pocket Guide to Interpersonal Neurobiology, The Developing Mind, Second Edition, The Mindful Therapist, The Mindful Brain, Parenting from the Inside Out (with Mary Hartzell, M.Ed. ), and the four New York Times bestsellers: Brainstorm, The Whole-Brain Child (with Tina Payne Bryson, Ph.D.), No-Drama Discipline (with Tina Payne Bryson, Ph.D.), and his latest Mind. He has been invited to lecture for the King of Thailand, Pope John Paul II, His Holiness the Dalai Lama, Google University, and TEDx. "Mindsight is an extraordinary and practical wedding of neuroscience and spiritual wisdom." "Dan Siegel combines his prodigious knowledge of brain science, clinical psychology and mindfulness with his immense capacity for original thinking to develop a new and useful concept—mindsight. His work will forever change the way we understand ourselves and our relationships." View any of the video modules online at your convenience. You'll have unlimited access to the videos, plus you can download the handouts for future reference! Plus, use the CE21 Mobile™ app to access the course content on-the-go, wherever and whenever you want on your mobile devices. Click here for course objectives and outline. Collaborate with other professionals on the course materials through interactive forums. You'll be part of a community of practitioners all focused on these materials, providing valuable opportunities to share insight and experiences, and to build your professional network. Complete your online CE tests and earn up to 36 CE Hours! Click here for total course CE Credit and approval details specific to your profession. You'll end this intensive training with a certificate of professional recognition from Dr. Daniel J. Siegel and the Mindsight Institute.